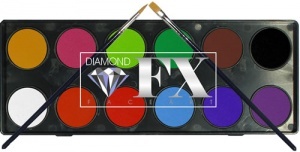 This metallic and neon palette from Diamond FX offers a sophisticated collection of professional palettes for great body art, with perfect coverage and high pigment concentration. Diamond FX palettes for body art are easy to use . All major colours on one palette! Each colour is suitable for detailed line work as body art with sponge . 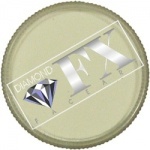 Diamond FX is easy to apply with a sponge or brush. Especially easy for line work. This paint does not need too much water to activate it. If too much water is used the paint will go gloopy in the pot. Let paint dry out fully before you put the lid back on. 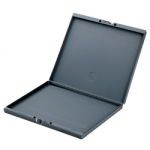 Click here for a Material Safety Data Sheet for Diamond FX Metallic and Neon products.